Flavor Text: He seemed to think everything was a story-even life. Even death. I assume that, if I were to win a conspiracy, I could still trigger the LP's Disrupt ability to select the next story that would come into play. The story I select just won't come into play until a non-conspiracy story is won, right? I think the answer is no. 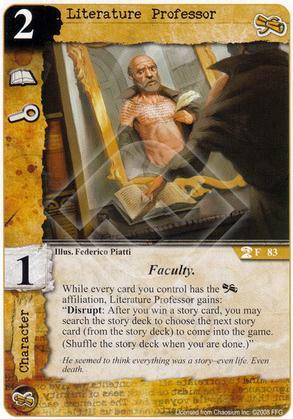 I concede you may be free to search the story deck, for a story of your choice, but what happens to it? You can't bring it into play, and if you leave it on top of the deck, it basically fails due to the next clause: (shuffle the story deck when you are done). If that said "shuffle the rest of the story deck", I could see an argument for the card being left on top, but as it is, I think the effect basically fizzles down to a usually meaningless shuffle of the story deck. Also, the triggered condition, "after you win a story", as a disrupt means you need to either use it right then, or you lose the window of opportunity, so I think there is no way to postpone the activation until later on when it might do something useful. Finally, it may be the effect itself can't even trigger. Since it requires you to "choose the next story card" and at that stage there really isn't a "next story card", it may be blocked by the lack of a valid target.